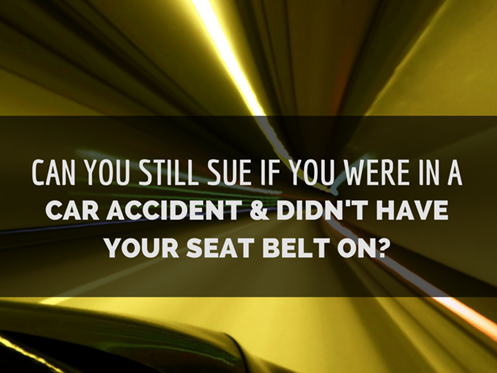 Arizona Car Accidents: Can You Sue if You Didn't Wear a Seat Belt? Longer response: Arizona is a "comparative fault" state. That means that each person is responsible only for his/her percentage share for the harm. If another driver causes a car accident and you are injured, you can make a claim for your injuries, medical bills, lost wages and other losses. The at-fault driver will be responsible for the harm you can prove caused by the accident. If you were not wearing a seatbelt, your recovery MAY BE reduced by injuries that resulted from not wearing a seatbelt. In other words, if you don't wear a seat belt and you sustain certain injuries because you didn't have it on, a judge or a jury has the option to declare YOU at fault for those injuries, and deny you a recovery for those damages. You should always wear your seatbelt, where driving to end of the block or farther. Seatbelts prevent injuries and seatbelts save lives. Protect yourself. Wear your seatbelt.